﻿Drafted by Phoenix Coyotes in the round 6th round (#139 overall) in the 1996 NHL Entry Draft, Robert Esche played for the Philadelphia Flyers from 2002 to 2007. 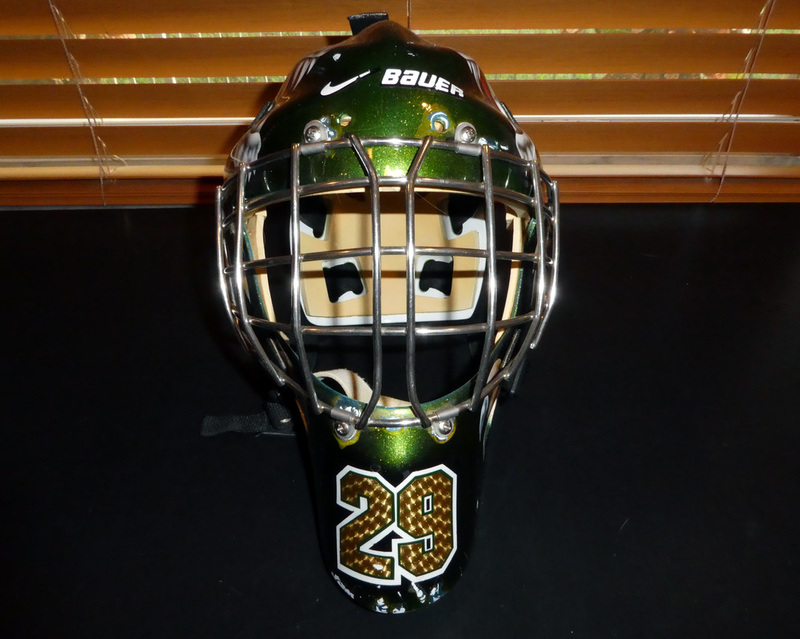 This mask appears to be the proto-type for Esche's mask for the 2007-2008 season. It was also worn in 2008 IIHF World Ice Hockey Championship qualification round at the Halifax Metro Centre on May, 2008 in Halifax, Nova Scotia, Canada. By all accounts, this mask appears to be identical to the mask he wore in the 2007-2008 season other than the ITECH logo on the crown. It would appear that this was an original design perhaps intended as a proof-of-concept that was accepted by Esche and then used as the model for the actual mask he wore during the season. As you can see from the pictures it is almost identical.